Lots of overall fun for kids (and adults) of all ages! Impressive,captivating aquarium for all ages, everything you need right here. It takes awhile to get oriented of the grounds but worthwhile vacation. Only negative was the girl representative for excursion who lied 3 times about the swimming with the dolphins. For 3 days she told us we were confirmef and every day we arrrived on time to find out there was no excursion. So plan this ahead with Disney since they own the Island where the swim occurs. I found this out after the trip was over. same advice as previously noted. 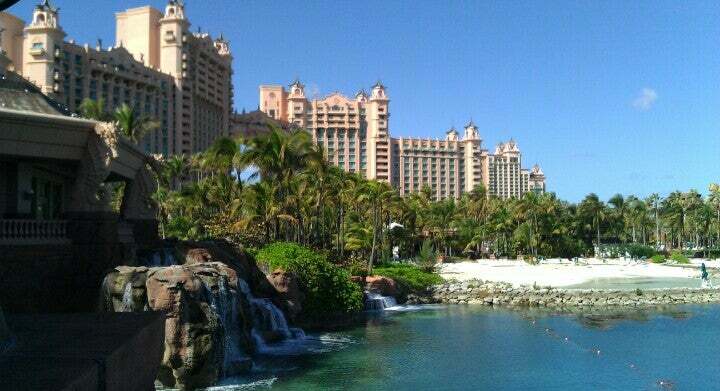 The Atlantis seemed like the perfect place for an extended family getaway for a long weekend in February. With most of the family coming from FL, it was a short hop to Nassua and for those of us coming from the Northeast, it was still a direct flight. With everything they have to offer for kids we thought it would be a paradise. And maybe it is, for some, but if you are looking for a Caribbean getaway where you can relax and get into the island vibe -- keep looking. You could easily spend days here and completely forget that you were in the Bahamas. The waterpark is great, but immense and hard to keep track of all the kids. And while there are options for kids under 48", most of the slides are intended for bigger kids or teens/adults. The aquarium tanks are probably the best part of the Atlantis and something that you'd usually have to pay admission for so maybe that helps you swallow the extremely high room rates. Speaking of rooms, they were plain and adequate. Certainly not worth the price we paid. The same goes for the food. It was expensive and mediocre. The property itself is immense and you will definitely have blisters on your feet and a sore back from carrying kids and gear across the property to get to the various attractions and restaurants. Of the 14 of us that went on the trip, only the kids would be interested in going back. The meal plan does not include things like room service or the on-site Johnny Rockets so if you are looking for flexibility to fit your family, don't prepurchase the meal plan. Also keep in mind that the hotel and water park are overrun with day trips from cruise ships so it isn't just the people staying the hotel that you need to worry about getting all the good seats at the pool or creating long lines for the water attractions. And don't expect steel drum bands or authentic Bahamian food. The snack bars by the pools serve your typical hamburgers, hot dogs, chicken fingers. Very generic, very Disney-like, yet with a cheesy Vegas vibe.